Sometimes you get diverted. I was doing research into Lancia engineering, and couldn’t make sense out of the commercial (truck) lineup. The names were confusing, the model variations were overwhelming. First, it needed a list of the models and the production volumes – but this was not so easy, as there was no single correct source. Part of this started with a source for the manuals. 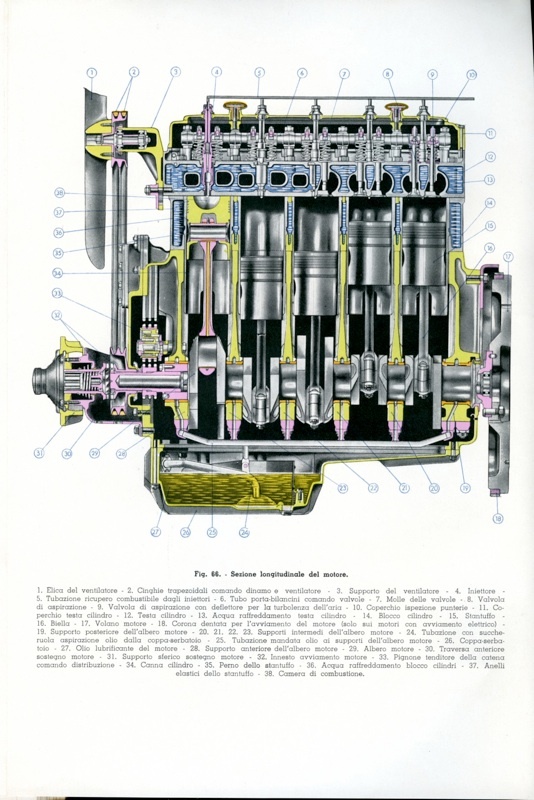 A rather incredible tech’l manual (repairs) for the 3RO from 1941 surfaced – and with its 400 pages of extreme detail were 20 color plates. 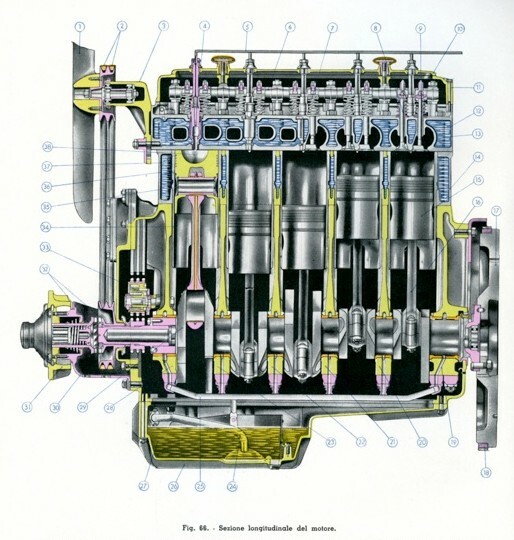 Above is one of them – a section through the then unique 5 cylinder heron head diesel motor. And there are 19 more plates to show…..
Luigi De Virgilio and I went through every bit of printed material we could find on the trucks. 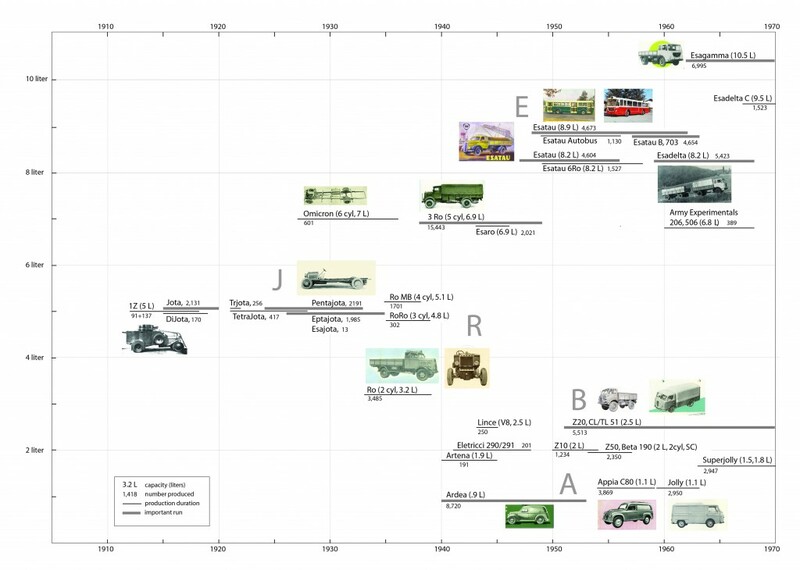 We looked at Wim Oude Weernink’s excellent La Lancia, Rosani’s and Amatori’s published numbers in Storia della Lancia, and Lancia Camion published by the Negri Foundation. Needless to say, no count was perfect. The spreadsheet is a bit massive, but most discrepancies have been resolved. Different model names, entries on the wrong lines, addition errors, and how do you count the trucks that Lancia made only the chassis, but not the bodies? Some forgot to count obscure military models …. all part of the puzzle. Finally an understanding of the models and their names fell into place and was not quite so hard…. once you get into it. Stroke size stays common on the big trucks for decades…. until they sometimes outsource the engine. No one said this was simple.